یقینی, مسعود, احمدپور, عباس. (1396). بهینه‌سازی دوهدفه زمانبندی حرکت قطارها و تخصیص لکوموتیو. پژوهشنامه حمل و نقل, 14(4), 85-96. مسعود یقینی; عباس احمدپور. "بهینه‌سازی دوهدفه زمانبندی حرکت قطارها و تخصیص لکوموتیو". پژوهشنامه حمل و نقل, 14, 4, 1396, 85-96. یقینی, مسعود, احمدپور, عباس. (1396). 'بهینه‌سازی دوهدفه زمانبندی حرکت قطارها و تخصیص لکوموتیو', پژوهشنامه حمل و نقل, 14(4), pp. 85-96. یقینی, مسعود, احمدپور, عباس. بهینه‌سازی دوهدفه زمانبندی حرکت قطارها و تخصیص لکوموتیو. پژوهشنامه حمل و نقل, 1396; 14(4): 85-96. می­باشد. در این مقاله یک مدل ریاضی جدید برای زمانبندی حرکت قطارها و تخصیص بهینه لکوموتیوهای موجود ارایه شده است. در این مدل ریاضی، از رویکرد زمانبندی کار کارگاهی و با هدف کمینه­سازی دامنه­ عملیات یا طول افق زمانی برای زمانبندی حرکت قطارها استفاده شده و کمینه­کردن تعداد لکوموتیوهای به کار گرفته شده به عنوان هدف دوم به مدل ریاضی افزوده شده است. برای تحلیل مدل دو­هدفه حاصل، از روش تصمیم­گیری مرز پارتو بهره­گرفته شده است. نتایج مسائل آزمایشی، نشان دهنده کارایی مدل ریاضی ارایه شده می باشد. 1Associate Prof. Dept. of Railway Engineering, Iran University of Science and Technology, Tehran, Iran. 2Marketing and Internal Transportation Expert, Raja Rail Transportation Company, Tehran, Iran. M.Sc. Grad., Dept. of Railway Engineering, Iran University of Science and Technology, Tehran, Iran. The train scheduling is one of the most important problems in transportation planning. This problem aims to generate a feasible train timetable subject to operational constraints. Furthermore, optimal utilization of locomotives should be considered in rail transportation planning. In this paper, a new mathematical model is proposed for train scheduling and locomotive assignment. In this model, the train scheduling problem is modeled using the job shop scheduling problem with the total length of schedule or makespan minimization as the objective function. Then, locomotive minimization is added to the model as the second objective. The obtained bi-objective model is analyzed by benefiting Pareto frontier method. Numerical examples are illustrated to prove the model efficiency. -حسن نایبی، ع.، و کیانفر، ف.، (1391)، "تعیین توالی اعزام و برنامه توقف قطارها در مسیرهای ریلی دوخطه راه آهن به کمک الگوریتم فراابتکاری جستجوی تصادفیِ تطابقیِ حریصانه". پژوهش نامه حمل و نقل، سال نهم، شماره سه، ص.235-257. -یقینی، م.، و لسان، ج.، (1389)، "برنامه‌ریزی عملیات حمل و نقل ریلی"، انتشارات دانشگاه علم و صنعت ایران، چاپ اول. 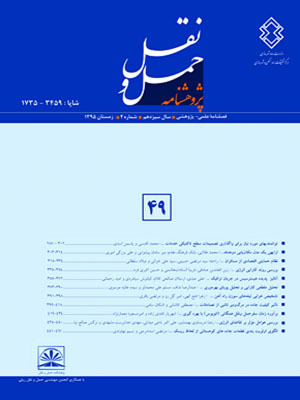 -یقینی، م.، و محمدزاده، ع.، (1390). «یک مدل زمانبندی حرکت قطارها با در نظر گرفتن زمانهای توقف برای نماز». نشریه تخصصی مهندسی صنایع، دوره 45­، شماره یک­، ص.103-116. -Assad, Arjang A. (1980), “Modeling of rail networks: toward a routing/makeup model”. Transportation Research Part B: Methodological, 14(1), pp.101-114. -Cordeau, Jean-Francois, Toth, Paolo, & Vigo, Daniele. (1998), “A survey of optimization models for train routing and scheduling”. Transportation science, 32(4), pp.380-404. -D’ariano, Andrea, Pacciarelli, Dario, & Pranzo, Marco. (2007), “A branch and bound algorithm for scheduling trains in a railway network. European Journal of Operational Research, 183(2)”, pp.643-657. “A multi-objective train scheduling model and solution”. Transportation Research Part B: Methodological, 38(10), pp.927-952. -Higgins, Andrew, Kozan, Erhan, & Ferreira, Luis. (1996), “Optimal scheduling of trains on a single line track”. TransportationResearch Part B: Methodological, 30(2), pp.147-161. -Liu, Shi Qiang, & Kozan, Erhan, (2009), “Scheduling trains as a blocking parallel-machine job shop scheduling problem. Computers & Operations Research, 36(10), pp. 2840-2852. -Liu, Shi Qiang, & Kozan, Erhan. (2011), “Scheduling trains with priorities: a no-wait blocking parallel-machine job-shop scheduling model”. Transportation Science, 45(2), pp.175-198. -Oliveira, Elias, & Smith, Barbara M. (2000), “A job-shop scheduling model for the single-track railway scheduling problem”. Research Report Series-University of Leeds School of Computer Studies. “A tabu search algorithm for the railway scheduling problem. Paper presented at the 4th Metaheuristics International Conference-book of abstracts.